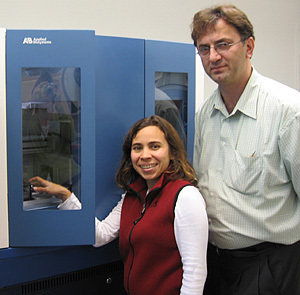 Senior sequencing associate Eveline Farias-Hesson and assistant professor of biomolecular engineering Nader Pourmand with new DNA sequencing equipment in the UCSC Genome Sequencing Center. Photo by B. Wagman. Scientists at the University of California, Santa Cruz, will be able to sequence DNA using next-generation high-throughput instrumentation, thanks to new funding from the California Institute for Quantitative Biosciences (QB3) and the STEPS Institute for Innovation in Environmental Research. The DNA sequencing equipment, available at the end of September, augments campus research capabilities and allows faculty, students, and research staff from several departments to undertake innovative projects and training activities. The new equipment will reside in the recently established UCSC Genome Sequencing Center (GSC). Nader Pourmand, assistant professor of biomolecular engineering in UCSC's Baskin School of Engineering, spearheaded the equipment acquisition and the establishment of the GSC. "A sequencing center at UCSC will facilitate collaborations that are likely to produce fundamental discoveries in microbial research with strong implications for biotechnology and drug target discovery," Pourmand said. Departments expected to benefit from the new sequencing center and its state-of-the-art equipment include Biomolecular Engineering; Ecology and Evolutionary Biology; Environmental Studies; Microbiology and Environmental Toxicology; Ocean Sciences; and Molecular, Cell, and Developmental Biology. "The GSC will foster interdisciplinary research in genomics, bioinformatics, and environmental biology and will open up extraordinary opportunities for research, teaching, and training in academic programs across campus," Pourmand said. "Essentially any program that uses genetic analysis can benefit from the instrumentation and technologies that will be available through the GSC." Faculty at QB3 partner campuses UC Berkeley and UC San Francisco will also have access to the equipment. Pourmand's laboratory focuses on technology development for biomedical research. He undertook the establishment of the Genome Sequencing Center as a contribution to the campus. The center is part of a concerted effort at UCSC to enhance research capabilities on campus and improve DNA sequencing methods and technologies. Researchers at UCSC are working to advance DNA sequencing technology and plan to develop critical technology for use in the GSC. For example, work in the center will include automating what is currently a complicated sample preparation process and increasing the length of DNA segments that can be read at one time. Increasing the "read length" will make it easier to assemble genomes. "The current standard is 35 base pairs, and we want to improve it," Pourmand said. UCSC experts will develop computer algorithms necessary for assembling, analyzing, and visualizing the genomic data generated from the new sequencing technologies. The GSC is also expected to augment development on campus of genome and microbial browsers, single-cell sequencing technologies, and nanopore sequencing techniques using electrophoresis. The California Institute for Quantitative Biosciences (QB3) is a multidisciplinary research institute designed to accelerate discovery and innovation that benefit society. The institute involves more than 180 scientists at UCSF, UC Berkeley, and UC Santa Cruz. The STEPS Institute for Innovation in Environmental Research is an interdisciplinary research institute at UCSC. STEPS fosters research and policy efforts to address the long-term effects of environmental changes worldwide. Note to reporters: You may contact Pourmand at pourmand@soe.ucsc.edu.